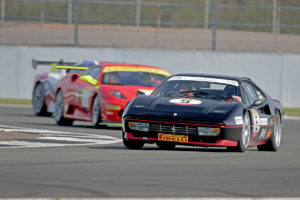 Our Ferrari season truly kicked off to an excellent start at Silverstone on Monday. 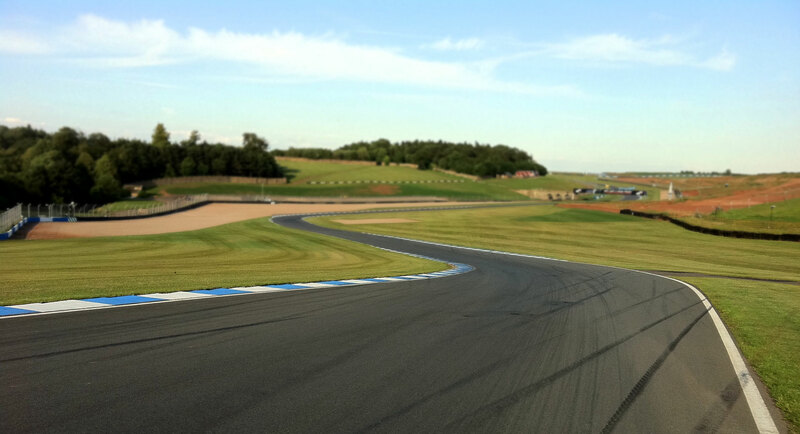 The track day – test & media day format worked exceptionally well and the weather was kind. Some 40 member’s road cars enjoyed the day in separate Touring & Sports sessions running to normal track day rules. 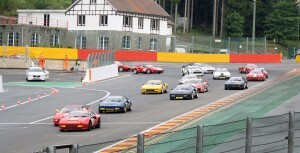 The 36 Competition cars however were given the freedom of the National circuit running to test day rules. The speed differentials were high and the competition sessions particularly entertaining but all behaved admirably and there were no incidents. It was particularly good to see new or returning drivers plus new cars and new liveries. Our photo shows Chris Butler’s newly black 328 which this year is enjoying the support of Barkaways. Originally Red and raced well by Jeff Simpson it then became Silver with Richard Allen before passing to Chris. 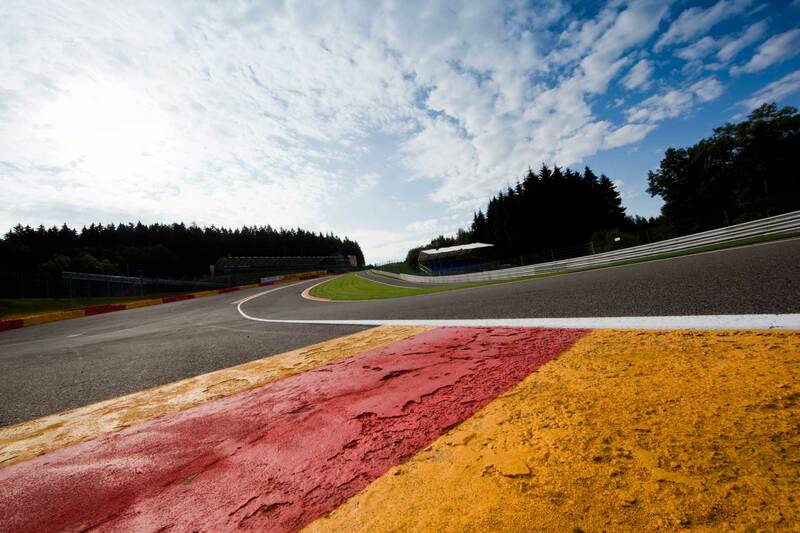 It will be at Spa next week for the FCRS event on a grid of some 37 cars, possibly the 2nd largest grid seen next to the 40 cars that raced at the Coys classic meeting years ago. We wish all a safe and happy week-end. Prizes for Pauline At The A.G.M. The club’s AGM was held this year at Graypaul’s Birmingham facility and was well attended. From our racing and hill climb family there were awards for several. 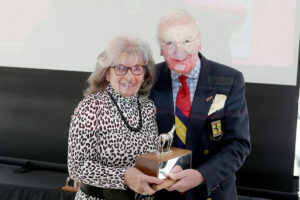 The most popular possibly being our own Pauline Goodwin who was awarded the Richard Allen Memorial Trophy for the competitor who best exemplifies the spirit of our hill climb series, and also the Godfrey Eaton Trophy for the spirit of the formula classic series. Husband Jon was presented with The Bumbles Trophy for the highest number of house points driving a V12 Ferrari. Other competitors present to collect awards were Peter Everingham (Mario Andretti Trophy), Chris Butler (Gilles Villeneuve Trophy), and Dave Snelson (Stephen Langton Award). The biggest cup of the day went to Gary Culver who was presented with the Anthony Bamford Trophy achieving the highest number of house points gained in a maximum of 10 competitive qualifying events. 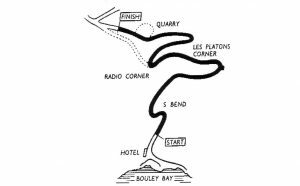 The Easter weekend sees the beginning of the Club’s racing season, as the hillclimbers start their treck to Bouley Bay in the Channel Islands for the first round of their championship on Monday 22nd April. The mysterious Tipster has again stuck his neck on the line with his predictions of what might happen – click here to read his improbable musings. With just three weeks to our test and media day at Silverstone our race season is nearly upon us, and thank goodness for that. Time perhaps to welcome a new driver to our formula classic series. 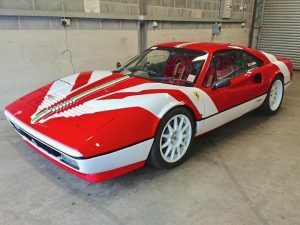 This very smart 328 GTB will be raced by new owner Darren Mills. Darren is new to racing and has recently passed his ARDS test. The car has a bit more experience being Ex. Tim Walker. Tim had a lot of success with the car in Group 3 a while back. We wish Darren lots of luck in his first season and look forward to meeting him at Silverstone. 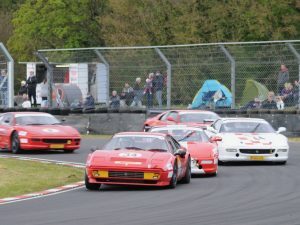 In other news we hear that Andy Christopher will be seen not only in his 430 but also in the 308 GTB that he raced many years ago. The car has been finished after a lengthy rebuild by Bell Classics and is set to make limited appearances this year. 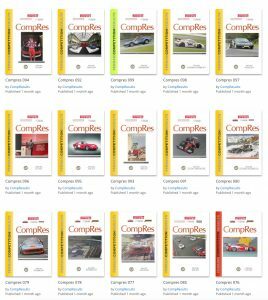 There are several drivers with cars in both formula classic & FCR and indeed we know one with cars suitable for these and the FNE series as well! Could be a busy year for some. 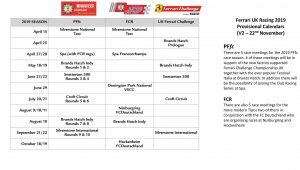 Steve Burns has recently sent out an email to all all those on his mailing list as Registered Competitors or those potentially interested in competing in the PFfc series in 2019. Key points to note are as follows. Spa Entry forms for the races on 27th/28th April have also been sent out. Time For A New Racecar? We don’t normally feature cars for sale here as the main Club site has an excellent classified section. However we thought it was worth mentioning this event. 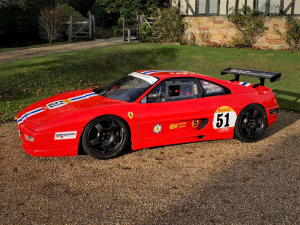 Silverstone auctions are offering the 355 Challenge car we have known raced very successfully by Nigel Jenkins in their January 12th sale the NEC Autosport Show. Real Challenge cars have risen dramatically in value in recent times. Most collectors though are looking for factory stock condition, and of course this car has been altered to race in both our series and AMOC Inter-Marque. However the estimate of £ 90,000 to £ 105,000 (plus premium of 15% Inc. VAT) possibly reflects this. Let’s hope the car stays in the UK and returns to our grids. Rumour has it that Nigel will look for a 430 Challenge if the sale of the 355 goes ahead. It is worth keeping in mind that we do tend to know when formula classic or FCR eligible cars are available, so it’s always worth contacting us, or the main Club office if you are in the market. 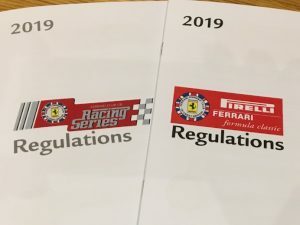 The regulations for both formula classic and Ferrari Club Racing have now been published, and regular racers will have received them. Our classic regs. have evolved over the years, as indeed they should. For 2019 there have been a few minor tweeks – these include a weight reduction for all but 355s and a success ballast for cars finishing in podium positions. Both changes are designed of course to even things up a little. 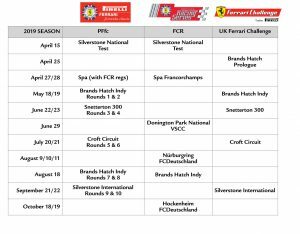 So that’s dates set, regulations published, get Xmas and New Year out the way, MSA medical and license renewal and there you go, Silverstone test, then Spa is next! The regulations for both series will be available on this site shortly under the “For Competitors” heading. 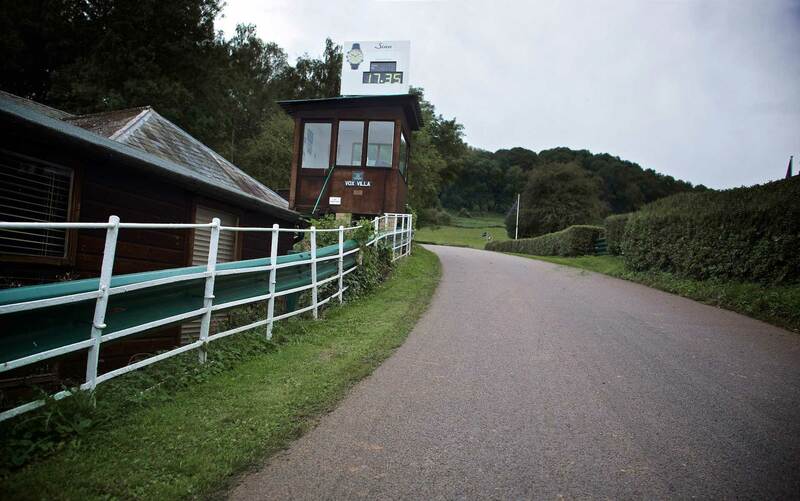 This has now been posted and you can see the Club’s circuit and hillclimb dates here. The 2018 PFfc season formally came to an end with a lunch in the historic Brooklands clubhouse on November 24th.The highlight of the awards was the presentation of the ‘Driver of the Century’ to John Swift. This was given to acknowledge a fantastic achievement, 32 years of continuous racing with the F.O.C. starting from the inaugural race at Mallory Park in 1986. 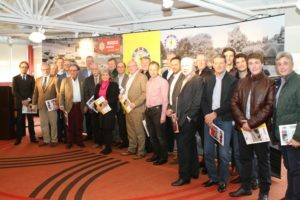 Series Sponsors, Simon Ford from Pirelli and Richard Wilkins from Indespension were welcome guests and handed out trophies to cover the achievements of the racers over the 2018 season. 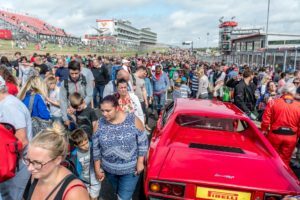 The event was even better attended than before with a packed Grid Walk. The racing was excellent with a very good grid. The full report with some top quality photographs can be seen on classic race reports section of the website. Some of you may have seen our Club’s promotional video for the formula classic series at the NEC or at our RAC prize-giving event. This excellent video is now posted on this site in the video section and is available by clicking here.